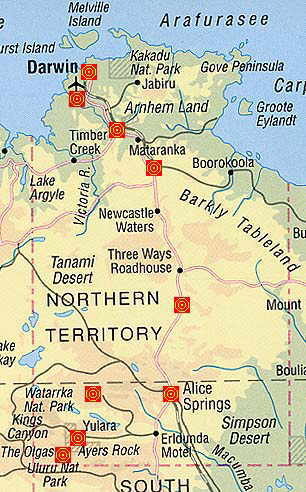 The Northern Territory covers an area of 1,35 million square kilometers. With a population of 182.000 (in 1998) there is 1% of the Australian inhabitants living in the Northern Territory, which covers the fifth part of the whole continent. Amongst the nationalparks in the Northern Territory are Uluru-Kata Tjuta Nationalpark with Ayers Rock and Watarrka Nationalpark with Kings Canyon. In addition there is a bright fauna with lots of birds in Kakadu Nationalpark in the northern part of the territory. The part of the Stuart Highway between Alice Springs and Darwin is home to the famous notorius roadtrains.